Fairness is a loaded word, but, whether we like it or not, it is at the heart of the political economy of debt restructuring in Europe. Fairness is a loaded word, but, whether we like it or not, it is at the heart of the political economy of debt restructuring in Europe. Until we reach some understanding on this issue, the conversation will continue to run in circles. Clearly the odious debt argument does not apply to Greece (Beck 2015). Greece was and is a democracy. Greek citizens elected the governments that ran the reckless fiscal policy that drove Greece into a deep financial crisis. With Philippe Martin we have estimated the proximate causes of the crisis in each Eurozone country. We find that Ireland was brought down by reckless bank lending, Spain by the sudden stop, and Greece by reckless government spending during the boom years. So there should be no question that Greece is first and foremost responsible for its own demise. But we – governments, households, investors – all make mistakes, and this is why debt restructuring exists. The problem is that Greece’s debt restructuring was hampered by the risk of contagion. The current firewalls (ESM, etc.) did not exist then. There was no banking union, no OMT. It was obvious to every observer in 2010 that Greece’s debt was not sustainable. Many advocated an early debt restructuring, coupled with strong fiscal consolidation, but the perceived risk of contagion made it impossible to implement. Eventually, in 2012, Greece’s debt was restructured. But this was clearly too late – much of the macroeconomic damage was done. Greece ran a reckless fiscal policy during the boom years, wasting much of the money that it received. There is no question that Greece needs a strong dose of fiscal consolidation. However, Greece’s debt should have been restructured much earlier. This restructuring was prevented by legitimate fears of contagion, and it is not fair to ask Greece to pay for that delay, which reflected a general lack of preparedness among Eurozone policymakers. If one accepts these two points, then it follows that one should consider an alternative history – with an earlier debt restructuring – as a benchmark for Greece’s debt negotiation. This is what I do. Unit labour costs and competitiveness. 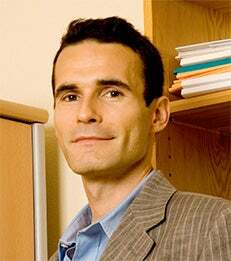 Thomas Philippon is an Associate Professor of Finance.